Blowout Sale! Save 85% on the USB Ethernet Adapter, Wirezoll USB 3.0 to Gigabit Wireless Network Adapter Supports Speeds up to 10/100/1000 Mbps for Macbook, Mac Pro / mini, iMac, XPS, Surface Pro, Notebook PC etc. Black by Wirezoll at AABX. Hurry! Limited time offer. Offer valid only while supplies last. Wirezoll USB 3.0 male A to RJ45 female ethernet adapter connects your computer or tablet to a router,modem or network switch for network connection. Wirezoll USB 3.0 male A to RJ45 female ethernet adapter connects your computer or tablet to a router,modem or network switch for network connection. The wireless network adapter adds a standard RJ45 port to your Ultrabook, notebook, Nintendo Switch or Macbook Air for file transferring, video conferencing, gaming, and HD video streaming. 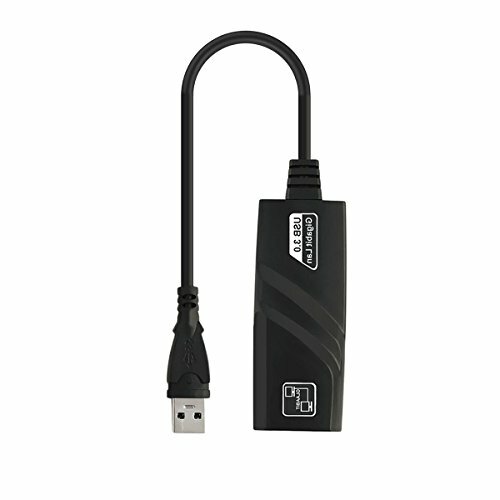 LIFETIME WARRANTY: Wirezoll USB Gigabit Ethernet adapter is backed with lifetime warranty and customer service support. 4. This adapter does not support wii u. Supports Windows (32/64 bit) 10 / 8 / 7 / Vista / XP, Mac OS 10.5 or higher. If you have any questions about this product by Wirezoll, contact us by completing and submitting the form below. If you are looking for a specif part number, please include it with your message.